David Pilgrim, one of the country's leading experts on issues relating to multiculturalism, diversity and race relations, will present "Watermelons, Nooses, and Straight Razors: Stories from the Jim Crow Museum," at 4 p.m. Sunday, Feb. 18, in Luther College's Center for Faith and Life Recital Hall. Sponsored by Luther's Center for Ethics and Public Engagement and Diversity Center, the lecture is open to the public with no charge for admission. Challenging audiences to think deeply about diversity and race relations, Pilgrim is a Ferris State University Distinguished Teacher whose goal is to get people talking about diversity and race relations in meaningful ways, and then to go and do something positive. 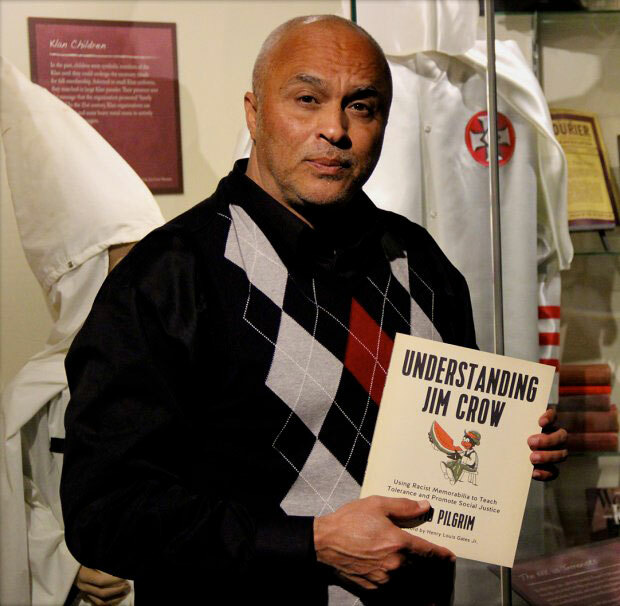 Pilgrim is perhaps best known as the founder and curator of the Jim Crow Museum, having put together a 12,000-piece collection of racist artifacts. Located at Ferris State University, the museum uses objects of intolerance to teach tolerance. In conjunction with the lecture, Luther is hosting "Hateful Things," a 39-piece traveling exhibition of items of material culture from the Jim Crow Museum. The exhibit is on display Feb. 12-March 2 in the Center for Faith and Life on the Luther campus. In addition to items from popular and commercial culture, the traveling exhibit also contains images of violence against African Americans as well as the Civil Rights struggle for racial equality. The exhibit, sponsored by Luther's art gallery program, Diversity Center, Center for Ethics and Public Engagement, Dean's Office and the college's Africana studies, English and religion departments, is open to the public with no charge for admission. Pilgrim, Ferris State University's vice president for diversity and inclusion, collaborated with Carrie Weis to create the "Hateful Things" traveling exhibit. The objects are accompanied by didactic panels that give observers access to their proper historical context and offer insight into their past and present popularity, and the aftermath caused by that popularity. Pilgrim is an applied sociologist with a doctoral degree from The Ohio State University who believes that racism can be objectively studied and creatively assailed. He produced, with Clayton Rye, the documentary, "Jim Crow's Museum," to explain his approach to battling racism. A "grisly low-key masterpiece," the documentary won several awards, including the Flint Film Festival's Best Documentary. His writings, both scholarly and creative, deal with multiculturalism and race relations. Pilgrim's short stories have been published in Calaloo, Obsidian, African American Review, Aim and Shooting Star. Pilgrim served, in 2006, as a consultant to Will Smith for the UPN television show, "All of Us." Smith called on Pilgrim's expertise to make sure that the episode, "The N-Word," dealt with issues of race and racism in a non-stereotypical fashion. In addition to the "Hateful Things" traveling exhibit, Pilgrim and Weis created a second traveling exhibition, "Them: Images of Separation," a 35-piece exhibition displaying the stereotyping of women, poor whites, gays, Jewish Americans, Native Americans, Mexican Americans, African Americans, Asian Americans and others to combat the idea that diversity is a black and white issue. "Watermelons, Nooses, and Straight Razors" is part of a larger effort at Luther to address the issue of hate in today's culture. For information about upcoming lectures and events, including the "Hateful Things" exhibit, visit luther.edu/events/.